ORADELL – Playing against Northern Highlands is a lot like doing the doggie paddle while trying to swim upstream. It takes a lot of hard work and it really does not get the swimmer any closer the destination. 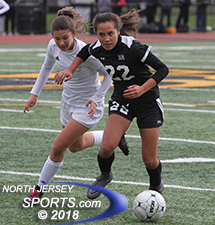 In Sunday’s Bergen County semifinal Northern Valley/Demarest, which was this deep in the tournament for the first time in its history, it battled the tide successfully for 40 minutes before Highlands breached the levy early in the second half. Using varied attackers and varying angles of attack, Northern Highlands turned its overwhelming advantage in possession into two goals inside the first 10 minutes of the second half. The Highlanders added another in the 57th minute and advanced to the Bergen County championship match against Ramsey for the second straight year. Highlands has won the county title every year but one since 2011. What makes Northern Highlands so tough to play against year in and year out is that the Highlanders take nothing for granted. If there is a through ball that looks like it is running long they chase it anyway. If a ball looks like it is going out of bounds, they try to save it anyway. If there is a ball in the air and an opponent looks to be in solid position, they challenge for it anyway. If one Highlander puts a shot on goal, the rest of them follow it. And if they do, by chance, give a ball away via turnover, they immediately shift gears and try to win it back. Under duress all game long, Demarest keeper Emma Miller finished with 13 saves. Because Highlands has the ball at its feet for so long and because it values each possession, opponents are posed questions that have no right answers. If a team chooses to pull numbers back to help the defend it winds up looking like an ice hockey team trying to kill off a power play for long stretches of time. If they choose to take their chances going forward against a stout and organized backline then space opens up and Highlands starts slicing and dicing. Demarest actually got off to a solid start. The Norsewomen made a few forays forward in the opening five or so minutes and found some feet on the flanks where they have speed and technical ability. 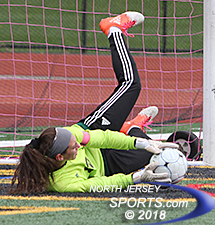 But by the midway point of the first half, Highlands had figured where the holes were, plugged them and then set about peppering the net of Demarest keeper Emma Miller, who was busy all game long. Highlands had a series of almosts in the first half. Among them were a rip from Grace Smiechowski, who rang the crossbar from 20 yards out 14 minutes into the game and two other chances were snuffed out by Miller, the senior keeper who recently announced (right here on northjerseysports.com) her commitment to the University of Colorado. In the 17th minute, Chloe Levy and Miller were in a 50/50 situation that ended in a collision and a save. Eight minutes later Levy tried from a little further away and her blast from 25 yards out was parried over the bar by Miller, who finished with 13 saves. Demarest had the final look of the first half when freshman Emily Holzer took off after a through ball and got close before Highlands senior and returning first-team All-County goalkeeper Sara Ghorashi slid out to clear away the trouble. Claudia Dipasupil scored the second goal for Northern Highlands, which will play Ramsey in the county final on Sunday. After that it was all Highlands. Katie Murray bundled in a rebound of a Mary Clair Flynne shot after Miller made the first save in traffic to put the Highlanders in front for good just 4:13 into the second half. Five minutes later Claudia Dipasupil headed home the ricochet of a Claudia Mischler shot that also hit the crossbar. Carolyn Weinberger closed the scoring with a 30-yard whistler from the right that finished inside the upper shelf on the left with 23:47 left in the game. The Highlands defense had it on lock down all day and closed out the shutout without allowing a second half shot on goal. So now it is on to another county final for the Highlanders, who will have a rematch with Ramsey, a team they shutout 5-0 in last season’s championship game. Note: One of the West Point speakers was Northern Highlands alum Claire Shea, now a second lieutenant in the US Army.